DUSU election: The Delhi chief electoral officer said Delhi University (DU) procured the electronic voting machines or EVMs "privately"
The election to select the heads of Delhi University's student body was marred by allegations of cheating after the chief electoral officer in the national capital clarified that the Election Commission never gave the EVMs -- several of which malfunctioned on counting day -- used in the campus polls. The election panel's statement that the electronic voting machines used in the DUSU polls were not issued by them came after some NSUI and ABVP supporters clashed at a counting centre in north Delhi's Model Town on Thursday. Counting was stopped for some time after several EVMs malfunctioned. 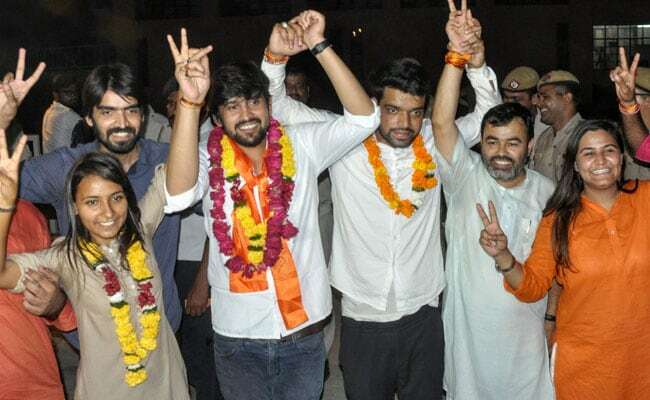 The RSS-backed ABVP won the three top posts --- president, vice president and joint secretary -- in the Delhi University Students' Union election, while the Congress affiliated NSUI took the secretary's post. The National Students' Union of India has made serious accusations of cheating, and with the Election Commission looking to send a detailed report on the matter, the Congress-backed student body is likely to escalate the issue. "...I am directed to inform that the EVMs in question are not of Election Commission as no such EVMs have been allotted/issued to DU by this office," Delhi chief electoral officer Manoj Kumar said in a statement late on Thursday. "It seems that the DU (Delhi University) has procured these machines privately," he said. Delhi Chief Minister Arvind Kejriwal, in a tweet, asked whether keeping an EVM without the Election Commission's permission would be considered a "criminal offence". Taking on the 'private EVM' angle, NSUI's Akash Choudhary, who won the DUSU secretary post, alleged that data from seven EVMs were missing. Polling was held at 52 centres across Delhi; 32 students contested the election. When it was announced that the Rashtriya Swayamsevak Sangh's student wing had taken the three top posts, ABVP volunteers broke into celebrations and burst firecrackers on North Campus. The Left-affiliated AISA and the Aam Aadmi Party's CYSS fought in an alliance, but could not get even a single post. Delhi University does not officially recognise any political outfit on campus, but those who contest the DUSU polls are backed by mainstream parties.